There are numerous pros and drawbacks about wind energy that you can look at including the possible problems occurred in using wind turbines. Natural energy sources are indeed a tremendous help for many people. Global warming is an environmental problem that resulted from the energy craving of human beings. Wind is produced due to the convection currents in the Earth’s atmosphere that are driven by the heat energy from the sun. Just like other forms of energy, this is also renewable and has no fuel costs. Harmful substances and gases are not produced by wind energy. However, wind plants may spoil the view for many individuals living nearby and are noisy as well. Listed below are the advantages and disadvantages of wind energy. 1. Through the modern technology, free wind can be captured effectively and efficiently. 2. Wind turbines installation does not produce harmful pollutants and any other green house gases. 3. Wind turbines take up only a small piece of land despite the fact that they are tall. It means that people living in the area can still use the free land most especially for agricultural purposes. Farming can still be done in the free space. 4. The availability of wind turbines in different sizes is other great advantage of wind energy. Many people and a wide range of businesses can use these turbines. 5. People living in remote areas such as remote countryside and mountain communities can make use of wind energy as an alternative to the typical power supply sources. 6. Another benefit of wind energy is that it can be combined with solar energy. It promotes a reliable, steady supply of electricity. 1. The primary drawback of wind energy is to the free wind’s unreliability factor. In some areas, the wind’s strength is quite low and unreliable to support wind farm or wind turbines and this is where the use of geothermal power or solar power can be an excellent alternative. 2. Wind turbines only produce minimal amount of electricity compared to other forms of energy. 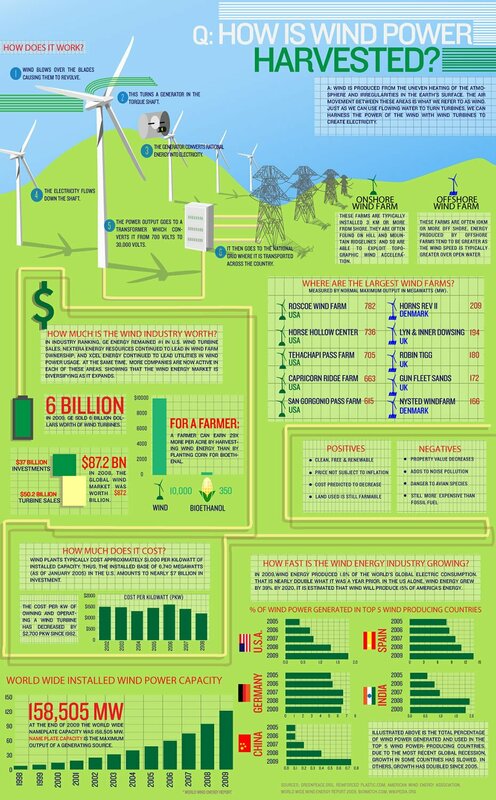 Because of this, multiple wind turbines are needed to be built in order to make a great impact and produce tremendous amount of electricity. 3. The construction of wind turbines can be very expensive and costly to surrounding ecosystem during the process. 4. Extreme noise is guaranteed by the installation of commercial wind turbines and is quite the same to a small jet engine. 5. Petitions and protests oftentimes confront any proposed wind farm development. Many people living on the countryside think that it is a major destruction to the natural beauty of the place. 6. Pollution is still present in the development of wind farms. 7. The reliability of wind energy is other disadvantage of it. This is because wind is unpredictable. If there is no wind to be collected and converted, then there will be no electricity source generated. All of those are the primary advantages and disadvantages of wind energy.